Angels’ share: The amount of alcohol which evaporates from the casks during maturation. My thoughts came back to this phrase over and over. Angel’s share. An Angel’s share of music coming from my chosen mandolin. An Angel’s share which would go unnoticed but for the resonant room lined with dozens and dozens of high-end mandolins, guitars, banjos. Continuing our series on the American-made instrument inventory of Acoustic Vibes Music, this week we turn our ears to WEBER FINE INSTRUMENTS of Bend, Oregon. Fortunate was I to want a truss rod adjustment on my Guild D-4 a few months back. Bernie welcomed me into the cool interior of Jeff Looker’s shop. Eventually I discover the mandolin room. 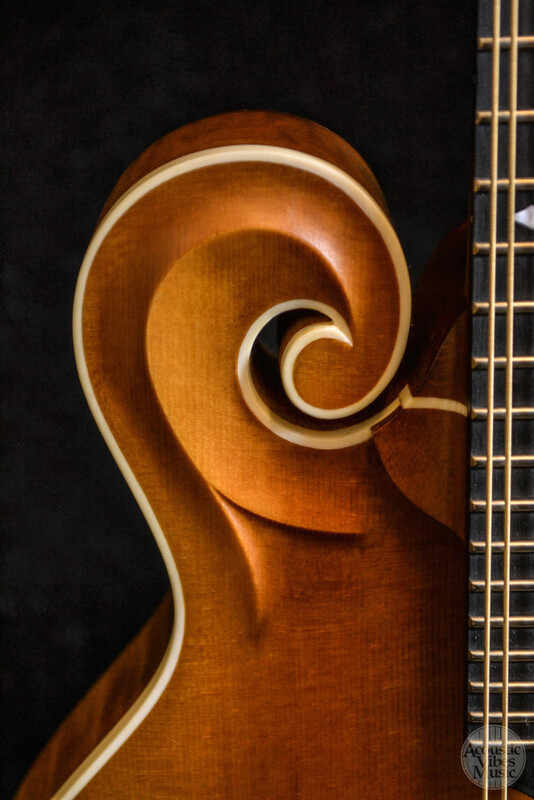 Most stores would call one or maybe two mandolins in the $800 range a high-end inventory. Jeff has a few like this; that is just the start. I had a unique opportunity to play mandolins of increasing quality (and cost) undisturbed. A dozen visits over a year sharpened my appreciation of the better instruments. Eventually I came back to one mandolin only, a mid-priced offering (list price $3600) that fit like your favorite jeans. A spritely tone, almost etherial sometimes. Giving me happiness to play, the mandolin had energy left over to play with the instruments around me. In time, dozens of instruments were gently resonating along with the mandolin’s song. When I stop, they continue for a time. It is, I think, what heaven sounds like. When I’m ready for an heirloom-quality instrument, increasingly it looks like I will choose the Weber F-Style Bitterroot mandolin. For looks, sound, playability, resale value, workmanship, materials, you name it. An average musician, which I am, will play better, sound better, and feel better. Well worth the investment. What cost a smile for life? This entry was posted in Craftsman / Artist, Music and tagged acoustic vibes music, Arizona's Premier Acoustic Music Shop, Bedell Guitars Bend Oregon, bend oregon, jeff looker, WEBER FINE INSTRUMENTS.